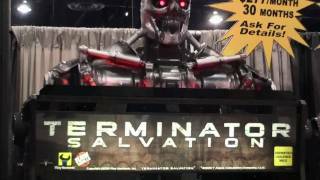 Get more detailed information and buy direct worldwide from BMI Gaming at : http:www.bmigaming.com - Terminator Salvation Arcade Video Game from BMI Gaming - Our #3 Pick of the Best Video Arcade Games shown at the Amusement Expo 2010 in Las Vegas ! Terminator Salvation Arcade Mission 1 3 Lights Out! World s Coolest Private Arcade! http:gamegridarcade.comOur new Terminator Salvation game after setting it up. I have videos of the setup which I can post in case anyone cares. This is a brand new arcade game, even though it's based upon a year old movie, it far outshines the console release of Terminator Salvation as it's a completely different game. http:gamegridarcade.com Here is a review for the new Blazing Angels arcade game by GlobalVR that was released earlier this year. It is unusual for a console game to become an arcade game but fortunately GVR did a good job in modifying the game to fit into something arcades could use. The game does have more to it than some arcades might, with free roaming gameplay and quite a number of different levels. It is a tough game though and even on easy setting people seem to have trouble with it on occasion. In addition to the great graphics BA also stands out when it comes to sound - featuring full surround sound and force feedback technology in the seat by Immersion even people outside of the arcade know when you're playing this game. You can play it at The Game Grid Arcade in West Valley City, UT at the Valley Fair Mall. Our entrance is on the outside of the mall facing west, next to the Red Robin restaurant. Don't let the construction work in the area scare you off!